The coat of arms of the great de Lacy family at All Saints church in Whalley. Hugh de Lacy (b.1009-d. 1095) is the Norman born father of the great conquest family. His feudal lord was Odo, Bishop of Bayeux and the half-brother of William, Duke of Normandy. Hugh married Emma “de Bois L`Eveque” from that same named location and it was their sons who took part in the 1066 Conquest; Ilbert, whose descendants ruled in Yorkshire and Lancashire, and Walter, whose descendants ruled in the Welsh marches and later in Ireland. 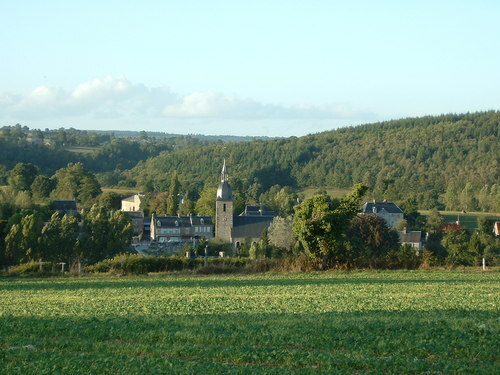 Emma de Bois L`Eveque was the second wife of Hugh de Lacy, Lord of Lassey, Normandy. She was one of two children of Ilbert, Marshall of Normandy from Bois L`Eveque. A Norman Marshall was the person in charge of the horses on behalf of the paramount Lord. The de Lacy brothers accompanied Duke William and his army to England in 1066. Ilbert de Lacy was in the train of Bishop Odo of Bayuex and Walter de Lacy who came in the train of William fitz Osbern. They fought at the Battle of Hastings and both received lands as a reward. Ilbert was prominent in the “harrying of the north” in present day Yorkshire in the winter of 1069-70 led by King William as the final subjugation of the Saxons in England. Ilbert de Lacy was a favorite of the Conqueror and William granted him 170 lordships in Yorkshire, Nottingham-shire, and Lincoln shire, including the Barony of Pontefract where he built a castle. He became a trusted companion and tenet in chief to both King William and his heir King Rufus until his death in 1093. His son Robert was heir and Lord of the Blackburnshire 100 and Pontefract. In 1102 he became lord of Bowland and held the honour of Clitheroe having been granted those crown retrieved lands the prior year by Henry l having seized them from Roger Pouti. The de Lacy family continued to accumulate vast areas of land in northern England until the death of Henry de Lacy (2) the 3rd. Earl of Lincoln Feb. 5, 1311 after which they reverted to Thomas Plantagenet, Earl of Lancaster. Thomas had married Henry de Lacy`s only daughter and heir Alice. This did not have a happy ending. Later Thomas was executed in 1321 at his wife’s family castle Pontefract, when his open hostility against Edward the 2nd. was put to an end after a civil insurrection. His de Lacy lands became part the new Duchy of Lancaster having reverted to the Crown. The de Mittons had already been disenfranchised of their Mitton manor holdings previously as a result of the above mentioned Henry de Lacy’s death, (3rd Earl of Lincoln) who had given them to his daughter Alice husband Thomas Plantagenet as a life estate upon his death in 1310. The de Mittons ceased to be lords of their Sur-named manor from that time forward. Note: The de Mitton family ceased to be Lords of Mitton manor after 1312 coinciding with the death of Henry de Lacy and were replaced as manor lords by Thomas Le Surreys as Lord of Mitton manor under that new feudal lord. Other lands did remain in de Mitton family possession including Aighton, Bailey, etc. as witness by later deeds in 1362 from the de Mitton sisters of Roger de Mitton to their cousin John de Bailey. Those holdings were part of what eventually became the Shireburnes of Stonyhurst Hall. Robert de Lacy had died in 1193 with out issue. Then the daughter of his mother Albrida, by her 2nd husband, Eudo de Lisours was also his half sister, Albreda Lisours, was then the wife of Richard fitz-Eustace. She then possessed herself of the Barony of Pontefract and all the other lands of her deceased brother Robert de Lacy, last of the original male line de Lacys of Nomandy who died without issue.Then her grandson Roger Fitz Eustace inherits from Alberta and takes the surname de Lacy and the second line of de Lacie’s begins from that date 1193. Jordan de Mitton b.after 1100 & succeeds his father Ralph the Red. *Robert (2) above and son of Henry, half brother of Ralph the Red, is end of direct male de Lacy bloodline from Ilbert de Lacy of the Conquest. He was a second cousin of Hugh de Mitton grandson of Ralph the Red. De Lacy “rapaceus eagal” (below) on effigy of Sir. Richard Shirburne at Mitton church denoting the family bloodline connections and descent of the Shireburnes from the Baileys, de Mittons and Ralph the Red, founder of Mitton church and first lord of Mitton manor to and from Robert de Lacy’s as the paramount Lords of Bowland family. Robert de Lacy was progenitor of all these scion families thru his illegitimate son “Ralph the Red”. The same “rapaceus eagal” appears at Whalley Abbey not far from Mitton on the wall denoting Henry de Lacy`s death mask and his grandfather John de Lacy, (signatory of the Magna Carta) tombstone also at Walley Abby built by Henry de Lacy, 3rd. Early of Lincoln. “Rapaceus eagle” meaning a ferrous bird denoting the de Lacy’s as a historically powerful family of the conquest and defenders of the realm. *Some have suggested that Ralph the Red was really the brother of Robert. That would mean he died in his 70s in the 1140s. It could have been what Ilbert meant when he identified Ralph as a brother on the charters.. But the date here would not have allowed Ralph to succeed. There is no record of that ever happening. *Ilbert identifies “Ralph the Red” calling him his brother on the charter which confirmed his grant of lands in 1135. *Robert, brother of Ilbert and Henry probably dies at the Battle of Standard 1138. Restored painting made before 1649 of Pontefract Castle, seat of the de Lacy’s. 2. Robert de Lacy (1) and “Ralph the Red’s” father who died before 1129. 3. Ilbert (2) eldest son of Robert (1) and who identifies Ralph the Red as his brother on a charter dated after 1135. (Ralph is the progenitor of the family de Mitton after the 1102 en-feudalisms). Ilbert(2) strongly supported King Stephen against Matilda . He fought at the Battle of the Standard  at Cowton Moor where David I [Ceannmhor] of Scotland was defeated. Ilbert II de Lacy (2) dies (childless) in 1141 after the Battle of Lincoln and is succeeded by Henry. 4. Henry, son of Robert (2) and younger brother of Ilbert(2) inherits from his brother. 5. Robert (2) son of Henry (1) dies in 1193 leaving no direct heir. Robert (2) was “ the last of the true Norman line” of de Lacy’s in England. Hugh de Mitton was often a witness to this Robert de Lacy’s charters. Hugh would have been a second cousin removed to Robert de Lacy. Roberts father Henry would have been the half brother of Ralph the Red and Ralph was Hugh de Mitton`s grandfather along with Otto de Mitton or as he became sometimes known as Otto de Bailey. *For a time the de Lacy’s were banished by King Henry 1 around 1108 (?)-1135. The de Lacy’s were replaced during that period as Lords of Pontefract and Clitheroe. Ilbert de Lacy (2) regained the de Lacy Barony upon King Stephen’s accession to the crown. 1. Hugh de La Val: 1114 to 1129. 2. William Maltravers: 1129 to 1135. ( richard of Hexham records that Maltravers was murdered by a knight named Paganus or Pain so that Ilbert could return. Ilbert and his men were pardoned by King Stephen ‘for all that they had done amiss’ between the death of King Henry I and Stephen’s coronation. Ilbert immediately confirms Ralph the Red’s original 1102 grant from his father circa 1135 with the addition of a second restated feudal grant recorded. 1. Roger Fitz Eustace, also sometimes known as “Helle” beginning 1193. He was the great, grandson of Albreda de Lacy, sister of Ilbert (2), Henry and Robert. From the male line of the original de Lacy family the estates passed to the female. The heiress, Albreda (2), daughter of Albreda de Lacy (daughter of the first Robert) and Robert de Lissours, had bee married twice, first to Richard Fitz-Eustace and afterwards to William Fitz-Godric. She was a first cousin to their last possessor Robert de Lacy and closest blood relative to Robert de Lacy (2) at the time of his death in 1193. There is record of a fine levied in the King’s Court at Winchester, on April 25th, 5th year of Richard 1 (1194), in which Albreda makes Roger the heir to all the de Lacy estates, whilst he at the same time quits claim to her other lands, inherited from her father, Robert de Lissours. Roger, immediately assume the surname of de Lacy. Thus a second de Lacy scion family came into existence from which the Constables of Chester, 5th Baron of Halton, and the Earls of Lincoln were incorporated from Fitz-Eustance side of the family. The Eustace’s had been the Constables of Chester and the Earls of Lincoln. Roger assumed the titles upon his fathers death and later inherited the lands and honor’s of the de Lacy’s, but not a drop of the de Lacy male bloodline. Pontefract and the de Lacy lands remained intact of his successors until the beginning of the fourteenth century (1310), when another failure in the male line left it in the hands of Alice, daughter of Henry de Lacy, the 3rd Earl of Lincoln and wife of Thomas Plantagenet, Earl of Lancaster who was executed at Pontefract in 1322 after the battle of Boroughbridge. Roger having assumed the name of de Lacy, (even though he was not of a male de Lacy bloodline) as founder of the second de Lacy scion line made “their residence at the great fortress and place of Pontefract”. Roger was also the Constable of Chester from 1193 to 1211 as was his father. Roger de Lacy held the de Lacy lands until his death in 1211. He was married to Maud (or Matilda) de Clere and had at least three sons. 2. John de Lacy; 1192 to1240 who became Earl of Lincoln in 1232, by his marriage to Margaret, daughter of Robert de Quincy. John was the eldest son of Roger (above). He was one of the 25 barons entrusted with of ensuring that the King John kept the agreements made in Magna Carta to which he was a was a principal signatory. Lacy died on 22 July 1240 and was buried near his father in the choir of the Cistercian abbey of Stanlaw (Lancs. ), his bones being moved to Whalley Abby (right next to Great Mitton and built by his grandson Henry de Lacy), when the monks transferred there in the 1290s. Below is the grave tombstone of John de Lacy at Whalley Abby today. Their is the faint outline of the de Lacy Rapaceus eagle as is on Sir Richard Shireburnes effigy (above) at the Shireburn chapel in Mitton church. 3. Edmund: 1230 to 1258 was the son of John (above). He married Alice, the daughter of Manfred III, marquess of Saluzzo. After the death of his father, John de Lacy, Edmund became a ward of the king and was given into the care of a tutor, Richard Wych, who later became Bishop of Chichester and was made a saint after his death on 3rd April 1253. He died at the age of 28. The last of the great de Lacy`s… their historic significance to the times and demise of the de Mitton family manor holding. Plaque in St. Paul’s, London identifying Henry`s DOD and as Lord Protector of the Realm. 4. Henry de Lacy, third Earl of Lincoln, Lord Protector 1249 to Feb. 1311 succeeded his father at the age of eight. This Henry, the third Earl of Lincoln whose name plays a conspicuous part in the history of his time-that “period of national glory,” as Hunter calls it, “the “reign of Edward I.”-was Lord of Pontefract for fifty-two years. When Edward l was on military campaign against the Scots and left Henry in charge of England in his absence with the title “Defender of the Realm” or as noted above on the inscription at St. Paul’s in London, “lord protector”. Edward l admonished his son the Prince of Wales that he was to “listen to Henry” during his absences. He was the King Edward chief consular and closest boyhood friend. In May 1301 he attended Edward, the Prince of Wales, during his invasion of Scotland, the king having made Henry Lord protector of the realm and told his son to listen to what Henry told him. Over the next two years he was heavily involved in negotiations with the French, was an envoy to the pope and continued to support the king in his attempts to take Scotland by force. Gaveston, who had nicknamed Henry de Lacy ‘Monsieur Boele-Crevee’ (Mr Burst Belly), was exiled and Henry joined his son-in-law, Thomas, Earl of Lancaster, in calls for a reform of the royal household. It was Henry de Lacy who later after the death of Edward l confronted the now King Edward ll regarding his favorite Piers Gaverston by leading a group of magnates and produced 3 articles of constitutional importance ie; “Homage and the oath of allegiance are more in respect of the crown than in respect of the king`s person“. His reputation was such the other barons backed Henry in this admonishment to the King. Gaveston, who had nicknamed Henry de Lacy ‘Monsieur Boele-Crevee’ (Mr Burst Belly), was exiled and Henry joined his son-in-law, Thomas, Earl of Lancaster, in calls for a reform of the royal household. Gaverston was executed a few years later outside of his wife’s family seat at Pontefract castle. Authors note: this may be where the concept of the “office of the Presidency” as enunciated by Harry Truman. It is the office that is to be respected from the person who holds the office. That is what President Harry Truman meant regarding General Douglas MacArthur usurpation of Truman`s office as the President and Gen. MacArthur obligation to respect that office regardless of what he might think of Truman personally. Henry de Lacy died Feb. 5, 1311 at a pivotal political juncture and was buried in St. Paul’s, London. Of his two sons and two daughters only his daughter Alice alone survived him. He was Lord of Pontefract, the 10th Baron of Halton, and Lord of Denbigh. He was also the 7th Lord of Bowland, so-called Lord of the Fells, being the last member of his family to hold that title. In 1294, Henry’s daughter and heiress had been contracted in marriage (when only nine years old) to Thomas Plantagenet, Earl of Leicester and a first cousin of Edward ll. The death of Henry de Lacy was significant to the history of the times given the conflicts of Edward ll reign. Henry was also earl of Salisbury and was the elder statesman of the magnates given his close and important relationship with Edward l. As a leading Baron he was well regarded, “vastly experienced and respected by all”. His death robbed England of an influential steady hand and altered the balance of England’s noble`s power. Henry has first married Margaret Longespee, the eldest daughter and co-heiress of Sir William Longespee and Maud de Clifford, daughter of Sir Walter.They were married before 01 June 1268, contracted on or before 23 Dec 1256, and had two sons and two daughters:* Edmund, born in 1271, drowned in a well in Denbigh Castle. * John, died at Pontefract Castle during his father’s lifetime. * Margaret, died in childhood. *Ann, only surviving daughter or issue of Henry became wife of Sir Thomas of Lancaster having been pledged to him at age 9 by her father, Henry. His lands were to go to Thomas upon his death. Henry retained a life estate to his lands until his death. Henry de Lacy`s son-in-law Thomas Plantagenet inherited Henry’s lands from Henry`s only daughter Ann upon his death as a result of the previous agreement. As Earl of Lancaster his already vast estates doubled with these new lands of the de Lacy`s that included the great fee of Pontefract. It immediately gave him lands now throughout England that were double that of the next most senor baron along with their military resources. History records he was an abrasive figure which resulted in schisms with his first cousin Edward ll and Thomas eventual execution in 1322. His tragic end was probably ordained by his complicity in the murder (execution) of King Edwards favorite Piers Galveston in June 1312. With the death of Henry de Lacy Feb. 2010 without male heir and the estate going to Henry de Lacy’s daughter Ann, the de Lacy lands went by agreement to her husband Thomas Earl of Lancaster. It was he who then removed the de Mittons from their manor by 1312 and replaced them with another family as the lords of Mitton manor. Thomas had a reputation of treating his tenants poorly. It seems to be the case here as well as the de Mitton family had held their manor for 208 years. But under the feudal system the paramount lord could do what he wanted with your manor lands no matter how long the family may have held them. The two sons of Henry, Edmund and John both tragically predeceased him as noted. It is thought that Edmund drowned in the well at Denbigh Castle and John fell from a turret at Pontefract (or from a window at Ightenhill Manor). These deaths may have affected the history of the times as much as the White ship death of Henry lst. son. After Alice de Lacy husband Thomas Plantagenet was executed as a traitor in 1322 most of the de Lacy lands were claimed by the King Edward II. Ironically they were the lands of his fathers great friend and principle consoler. And ironically Henry was the principle Baron who had stood up to the abuses of Edward ll much as his grandfather had to King John as a signatory and surety to the Magna Carta. 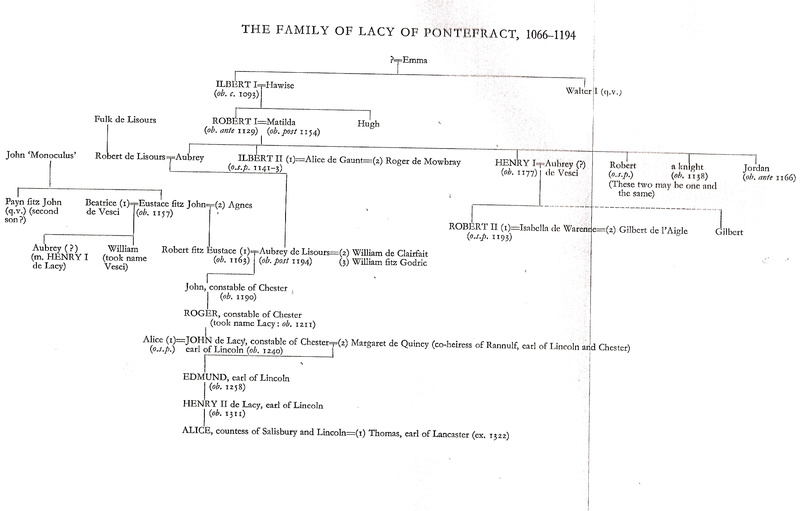 The de Lacy family from Normandy and successors to the de Lacy barony. Ilbert de Lacy, of the conquest, 1st Baron of Pontract (1045, Lassy – 1093, Pontefract), son of Hugh de Lacy, who received lands in Pontefract. Robert de Lacy, successor, 2nd Lord of Bowland, 2nd Baron of Pontefract, the son of Ilbert. He founded Pontefract Priory and built Clitheroe castle. Ilbert de Lacy, 3rd Lord of Bowland, 3rd Baron of Pontefract, the eldest second son of Robert de Lacy and successor to his father Robert above. Henry de Lacy, 4th Lord of Bowland (1070, Halton, – 1123), 4th Baron of Pontefract, the second son of Robert de Lacy. Successor to his older brother Ilbert above.He built Kirkstall Abbey. Albreda de Lacy, daughter of Robert de Lacy, who married Robert de Lissours. Sister to Ilbert, Henry, Robert and half-sister to Ralph the Red. Robert de Lacy, successor to Henry above, 5th Lord of Bowland (died 1193), 5th Baron of Pontefract, son of Henry. Albreda de Lissours (de lacy), the daughter of Albreda (1) de Lacy above who married Richard fitz Eustace John FitzRichard (1171–1190), the son of Richard fitz Eustace. He served with King Richard I of England in the Third Crusade and died at the siege of Tyre. Roger de Lacy (1170–1211), 7th Lord of Bowland, 6th Baron of Pontefract, 7th Baron of Halton, was the son of John FitzRichard and the grandson of Albreda de Lacy (2). He adopted surname de Lacy. In addition to inheriting his grandmother’s vast holdings, Robert also inherited his father’s titles of hereditary Constable of Chester and the Barony of Halton. John de Lacy, 2nd Earl of Lincoln (c.?1192 – 22 July 1240), 8th Lord of Bowland, 7th Baron of Pontefract, 8th Baron of Halton, son of Roger. He and his cousin Robert de Vere, Earl of Oxford, chosen surety to enforce the King’s adherence to Magna Carta. John de Lacy was buried in Stanlow Abbey. Edmund de Lacy, Baron of Pontefract, 9th Lord of Bowland, 8th Baron of Pontefract, son of John. He inherited his father’s titles but as he predeceased his mother he never became the Earl of Lincoln. Henry de Lacy, 3rd Earl of Lincoln, 10th Lord of Bowland, 9th Baron of Pontefract, Lord Protector of the Realm (regent), son of Edmund and grandson of the 2nd Earl. Lord protector of the Realm and principle consular to King Edward l and regent to the Prince of Whales. Alice de Lacy, 3rd Countess of Lincoln, only surviving child of the 3rd Earl of Lincoln henry de Lacy above. She was the last member of the family to hold the Lordships of Bowland and Pontefract and the de Lacy titles until her death in 1148. For another historical biography of the de Lacy family please see the following website by Elizabeth Ashworth, author of “The de Lacy Inheritance”. It has a history of the family members including Ralph the Red. Ilbert de Lacy (1045, Lassy – 1093, Pontefract), 1st Baron of Pontefract, son of Hugh de Lacy, who received a large fief in Yorkshire, Lincolnshire and Nottinghamshire and built Pontefract Castle. Robert de Lacy, (probably died before 1130) 2nd Baron of Pontefract, 2nd Lord of Bowland, the son of Ilbert. He founded Pontefract Priory about 1090 and built Clitheroe castle. Ilbert de Lacy, (died c.1141) 3rd Baron of Pontefract, 3rd Lord of Bowland, the eldest son of Robert de Lacy. He was captured with King Stephen during the Battle of Lincoln (1141), possibly dying in captivity. Henry de Lacy (died 1177), 4th Baron of Pontefract, 4th Lord of Bowland, the second son of Robert de Lacy. He built Kirkstall Abbey. Robert de Lacy (died 1193), 5th Baron of Pontefract, 5th Lord of Bowland, son of Henry. Although he married he had no children. Buried at Kirkstall. Albreda de Lacy, daughter of Robert de Lacy the 2nd Baron, who married Robert de Lissours. Albreda de Lissours, the daughter of Albreda de Lacy who married Richard fitz Eustace. John FitzRichard (died 1190), 6th Baron of Halton, the son of Richard fitz Eustace. He served with King Richard I of England in the Third Crusade and died at the siege of Tyre. He founded Stanlow Abbey on the banks of the River Mersey in 1178. Roger de Lacy (1170–1211), 6th Baron of Pontefract, 7th Baron of Halton, 7th Lord of Bowland, was the son of John FitzRichard and the grandson of Albreda de Lissours. He adopted surname de Lacy. In addition to inheriting his grandmother’s vast holdings, Robert also inherited his father’s hereditary title of Constable of Chester and the Barony of Halton with Halton Castle and the lordship of Donington in Leicestershire. In 1205 he purchased the barony of Penwortham It seems that one of his daughters married Alan, Lord of Galloway (died 1234), who later marry Rose the daughter of Hugh de Lacy, 1st Earl of Ulster. John de Lacy (c. 1192 – 22 July 1240), 2nd Earl of Lincoln (from 1232), 7th Baron of Pontefract, 8th Baron of Halton, 8th Lord of Bowland, son of Roger. He and his cousin Robert de Vere, Earl of Oxford, chosen surety to enforce the King’s adherence to Magna Carta. John de Lacy was buried in Stanlow Abbey. Maud de Lacy (1222–1262), eldest child of the 2nd Earl. Married Richard de Clare in 1238 becoming the Countess of Hertford and of Gloucester. Edmund de Lacy (c.1230-1258), 8th Baron of Pontefract, 9th Lord of Bowland, son of John. He inherited his father’s titles but as he predeceased his mother (Margaret de Quincy) he never became the Earl of Lincoln. Henry de Lacy (c.1251–1311) 3rd Earl of Lincoln, 9th Baron of Pontefract, 10th Lord of Bowland, son of Edmund and grandson of the 2nd Earl. In 1282 he was granted the Lordship of Denbigh and built Denbigh Castle. He oversaw the transfer the monastery from Stanlow to Whalley near Clitheroe in 1296. Alice de Lacy,4th Countess of Lincoln, 5th Countess of Salisbury (daughter of the 3rd Earl). Also inherited the Earldom of Salisbury through her mother Margaret Longespée. In 1294 Alice was married to Thomas of Lancaster, the nephew of King Edward I of England. Under the terms of the marriage settlement the bulk of her inheritance would go to her husband upon her father’s death. A brief biography of Henry de Lacy the last paramount blood line connection to the Mittons. * Margaret, died in childhoodSecondly, he married Joan Martin, the daughter of William Martin, Lord Martin, and Eleanor, daughter of Sir Reynold Fitz Peter. They were married before 16 June 1310 and had no issue.Henry also had an illegitimate son, John de Lacy, who had a son, Edmund, and bore the coat of the Lacy Earls.Henry lost his father when he was a young child, and inherited all the titles and lands from Edmund and his paternal grandmother under the wardship of his mother until he reached twenty-one when he became the Earl of Lincoln.Sir Henry was known as one of the most trusted and influential men of his time, clearly devoted to King Edward I as one of the king’s chief councillors. Henry and John de Warenne, the Earl of Surrey, were involved in a private war about some lands, which Henry III stopped by bringing that issue to court. Henry was knighted in 1272 along with the king’s nephew, Henry of Almain. Henry was present at the Siege of Castle Baldwin and the taking of Dolforwyn Castle near Montgomery. Henry went ‘beyond the seas’ in 1278 to arrange for the marriage of the French king Louis IX’s daughter Marguerite, to John, the son of the Duke of Brabant. Soon after he escorted King Alexander III of Scotland on his visit to England. He was appointed to be one of the Lieutenants of England during the King’s absences in France, and was awarded the cantreds (can = hundred, tred/tref = town or village) of Rhos and Rudeniog for his service in Wales, as well as the Lordship of Denbigh where Henry built Denbigh Castle.